"Gold and Silver Intertwining Grandmother's Name Ring, Double"
Our bestselling design never goes out of style ~ now in sterling silver and 14K gold! The double grandmother's name ring is a customer favorite and once you put it on you will discover how meaningful it is and never want to take it off. Always have the ones you loved wrapped around your finger! Just another way to upgrade our classic styled rings ~ we are pairing sterling silver and 14K gold in our family rings! Stamp up to 12 characters on each band with names, dates or anything you can think of! This heirloom gift is perfect for Mom, Grandma, friends or a couple. While the most popular option is to put one name on each band - you can also use your imagination to create your custom ring. 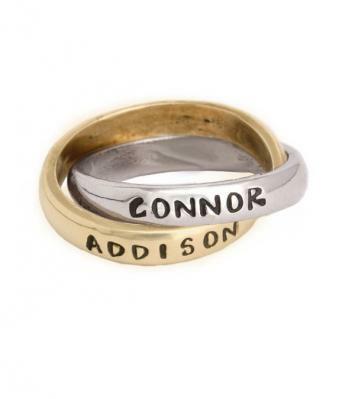 Personalize this ring with names, nicknames, dates or special words. For the mother or grandmother of one you can put a name on one band a the birth date on the other. For the Mother or Grandmother of three put both girls on the gold band and the boy on the silver band or vice versa. For couples, put the names on each band or both names on one band and anniversary date on the other. PLEASE NOTE: These rings take about 3 weeks in production. If you need the ring faster, please call the office and see if we can accomodate the rush and the cost involved. Dimensions: The sterling silver and gold bands are approx 3mm wide and can be stamped with up to 12 (silver) or 9 (gold) characters/spaces. Please note the bands are interconnected and will always move around. The same band will not always be on top. Prices include stamping. Because this item is customized all sales are final. Sizing: When determining your size, we ask that you give us a size that is a snug but comfortable fit. If you are unsure of your size, you can purchase a ring and select ring sizer from the dropdown menu. We will send you a ring sizer and instructions on how to email us your size. Please do not force a ring onto your finger. We only use 14k gold and sterling silver.